The post-war location of the children’s home had originally been a Victorian domestic property known as Wick Lodge, which later became St Michael’s Hall School, an educational establishment for boys. During the war the place was taken over by the military. In 1945 the religious order was able to purchase the main building, known as Claremont. An adjoining property, Woodside, at 3 Lansdowne Road, was acquired in 1948 to be used as a kindergarten for the under-fives at the request of the local authority who used to subsidise the work. Although St Ann’s Well Gardens was nearby, the name of the home was in fact coincidental, St Anne being venerated as the mother of the Virgin Mary, for whom the nuns had great devotion. The water source in the nearby public gardens just happened to be dedicated to St Ann in common with several other holy wells in various parts of the country. Both girls and boys were cared for at St Anne’s Home for Children, which was for them more like a big family unit from which they used to attend nearby schools just as any other local child. This use of the premises continued until there was a change of County Council policy in 1983 in favour of relocating such children with foster families. Despite this, St Anne’s Home did not close down. From the mid-1980s it was used for residential care for people with learning difficulties, and work with the homeless. 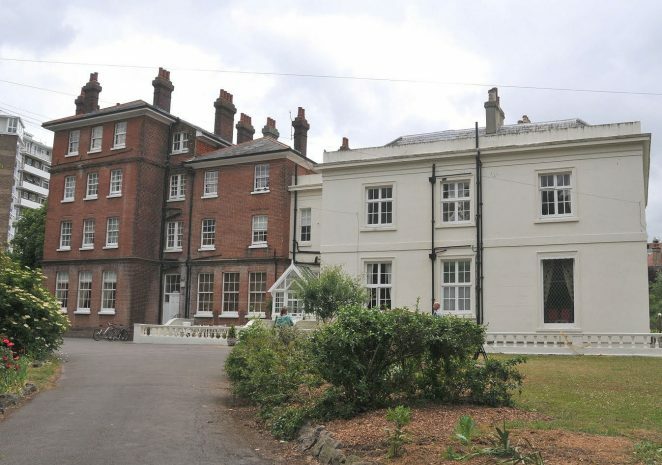 For a period the unit called Marina (3a Lansdowne Road), along with Woodside, was leased to East Sussex County Council to provide day care facilities for mothers and young children, and residential accommodation for young girls. The order also operated a soup-kitchen and clothing store. This work continued until 1994 when the nuns moved out into nearby Woodside, re-naming it St Anne’s Convent, where they remain to this day. The former St Anne’s Home (Claremont) was placed on the market, while Marina continued to be used for the care of persons with learning difficulties. While unoccupied, the old buildings were taken over by squatters who caused a great amount of damage before they left after being served with an eviction notice in 1995. However, in 1997 the premises were once again restored to good order when they were purchased for their current use as the Bodhisattva Kadampa Meditation Centre. Many children passed through the doors of the home during the thirty-five years of its operation. There are many memories. One that stands out is the time that they were invited in as extras during the making of the film Oh! What a Lovely War, a musical about WW1 filmed in 1968 in many locations around Brighton and starring all the leading British actors of the day. There was also an earlier film called The Secret, which was actually filmed partly in St Anne’s Home, featuring the children and some of the nuns, and also at the Brighton Film Studios in Centurion Road. I would like to gratefully acknowledge the assistance of Judy Middleton’s Encyclopaedia of Hove, Paul Shaw, the Archivist for The Poor Servants of the Mother of God, the Archivist for the Catholic Diocese of Arundel and Brighton and David Fisher, in providing information for this article. I have many happy membries of St Anne’s children’s home/convent, and was in the film ‘Oh what a lovely war’. I was taken out to the pictures by a family who were acting as aunties and uncles, was taken to see Chitty Chitty Bang Bang, when i returned the gates had been locked and I had to climb the smaller side gate with my acting uncle and walk up the long drive in the dark to the main door knocking and ringing the bell untill one of the nuns opened the door, only to hear ‘forgot you were out’. Wonderful to read the history and see a photo of where I grew-up, St. Anne’s Hove. I was in Woodside aged Three, then went over to Claremont but sadly no photo’s of the place, cannot see the building from the gates at the bottom of the drive. Went to Mary Magdalena Junior School, is it still there? Can you tell me the name of the Church almost next door? I had my First Communion and Conformation in there, big events in a child’s life. Walked every day to senior school The Sacred Heart in Hove which was in Two parts, one uppermost of the road name already mentioned run by nuns, lower part of road more modern building at the time, no nuns! Please could you refresh my memory by telling me (1) Name of road school was in? (2) name of second building or was it still part of The Sacred Heart? (3) Are the schools still there but known by a different name? Hope you will be able to help me as I might have moved away but my roots are still in Hove. Thank you for the photo that brought back memories but which I can share with my family. Julie – great to hear you were in the film. Did you ever see yourself in it? Thank you for your memories. Bernice – not sure about the Junior School, but the senior schools you ask about were in the Upper Drive. The former schools there were all amalgamated into the present day Cardinal Newman comprehensive school as far as I can tell. You can find out more if you put Cardinal Newman into the search box at the top of this page. You can also look up Cottesmore for more info on St Annes. Pat, I have not seen myself in the film. I am trying to get film so I can watch it with my 16 year old daughter. My sister Andrea and myself were at St Anne’s from 1963 until 1966. Our time there was sometimes lovely but also not so great. I particularly hated doing my week in the kitchen. I used to love going over to see the babies on Woodside. The long drive is one of the memories I have, as was the plank swing in the garden . My sister and I were in St Joseph’s group with Sister Beniganus, a young pretty Nun who was kind. I was at St Anne’s in the late 60s with my two brothers and older sister, our baby sister wasn’t allowed as the convent didn’t at that time take babies. I became good friends with two sisters called Anna and Veronica, I was particularly close to Anna, perhaps being abandoned by my mother had something to do with this? The nuns were great and fun, my young brother was very close to Sister Loretta, she wore white habits most of the time. My brother used to stay with her during the night as he was inconsolable, cried all the time. The dinner lady scared the hell out of me, pulled my hair to make me eat my food. I just for some reason couldn’t, wouldn’t eat all my food. Gill who worked as a volunteer, took my hand and let me spit it all out down the toilet, she was quite literally a godsend, and to this day is the only person and her husband who’ve known me from the very early journey of my life. I recently re-visited the convent as I will always affectionately know it, and was surprised that the Buddhists had now taken it over. One thing I do remember, and very vividly, is the drive up to the main door, and the concrete pebble-dashed garage that housed the mini-bus. As I walked up drive, I said to my then girlfriend, there’s a garage up here on the left, and sure enough I was right. We had many trips out in this bus, and always seemed to sing ‘my bonny lies over the ocean’. Funny, that from our walk along the front, I was able to mentally navigate our way right to St Anne’s. Although I was never there for very long, a couple of years maybe three, it will always hold a special place in my heart forever. My thoughts are with you all who once, like me, walked and ran around the convent in the care of such beautiful people. I too lived at St Anne’s from 1950 – 1967. I have many photographs of my days there and I still keep in touch with Monica and Dot who were ‘in charge’ of St Martin’s Group. Tonight I have learnt that Dot may not make it through the night as she had a stroke and has been in a care home for the past 3 years. Not only do I remember taking part in the film ‘Oh What a Lovely War’ but also in 1954 I appeared in a film called ‘The Secret’ which was filmed at St Anne’s. Many of the other children also appeared in it and although I was only 5 at the time I can still remember filming in the Brighton Film Studios. Many summers were spent having picnics for us 60 children on The Devils Dyke and many Christmas parties were attended which were organised by the Post Office, M&S and other big businesses. I have many other memories and although the nuns were very strict it was a good childhood although it did not prepare you for the ‘outside world’. By the way I was known as Anne Wall and I remember you Vincent. I was at the Kids Home in the early eighties. I have a lot of great memories there and in fact all of my happy childhood memories are from when I was there. Veronica Anne Tumbler, please contact me via my email (vincentmenham@hotmail.com). I’m curious to ask how and what you remember about me. You say you also have pictures which I’d be interested to see. Thank you. Hi there everyone. I just came across this site after a friend told me about it. I stayed at St Anne’s in the early ’60s at the same time as Veronica above mentions. Monica rings a bell but I’m sure there was a helping out there called Rose. I can remember Sister Dominic. Yes, I also remember the place as somewhere that was nice for me as a child. How interesting to read memories of other people who lived at St Anne’s. I was there from 1949 till 1962 and would love to share memories if anyone remembers me. I remember St Anne’s Convent in Brighton – my sister, Elizabeth and I (then known as Muriel) used to take out two young sisters from Ireland – I can’t remember their names now – this must have been in the 1950s. They had a young brother too. We used to take them on outings and take them home to have tea with our family – they were very fascinated with our bathroom as they had to share bathrooms at the home. They also used to keep a little of the afternoon tea that we gave them to take back for their younger brother. I believe that their father eventually married again and was able to take them home to Ireland. My sister Muriel and I used to take out two little girls in the 1950s. They lived in St Anne’s with their two little brothers. We loved having them to our home, giving them a lovely tea and sometimes a little gift. One day we observed them sliding food in to a paper bag that they had asked us for, it was to share the tea with their little brothers at the home- we were so touched by this. I wonder if the two sisters from St Anne’s Home in the 1950s are Maureen and Eileen? They had two brothers in the Home with them. Father used to visit them, but could not have them with him. Hi all, I was at the convent with my brother in 1954, my name is Linda Beirne. I’d be interested in any photos you all may have. Whow, so glad my sister told me about this site. My sisters and I were at Saint Anne’s in the 70s. I have very happy memories and sister Anna was my favourite sister. My sister visited St Anne’s at the weekend. Sadly it was closed so she didn’t get to look around. Many happy times had here. Lovely staff -thank you to them all. Hi, I lived at Woodside and Marina House with my brothers Anthony and Paul and my little sister Michelle Benyovits. I have happy memories of living there with all the other children and nuns and carers who looked after us. My favourite person was Maggie Hoy. I remember our variety minibus and being in the film ‘Oh what a lovely war’ and our first holiday trip with the nuns was to Butlins at Camber Sands. I was naughty and got sent home early. It’s my big 50 this year and it has taken me this long to accept how my life has been in the past and to realise it was never my fault that I was placed in Woodside. Thank you to everyone who looked after us. Does anyone know if ok to put a pic on and is there any more sites for St Anne’s? Hi my name is Nina Alberici. I was in St Anne’s childen’s home with other children. I would love for any one who remembers me to write back. I do remember John and Anne and also the cook who was found dead at the time. St Anne’s was one of the recipients of Marks & Spencer’s ‘waste’ food. I worked at M&S London Road in the 1970s-80s. ‘Waste’ was the out-of-date or damaged food that was sold to the staff at a reduced price at the end of the day. What was left went to a range of different local good causes (long before the FareShare scheme). It was always a long drawn out affair when the nuns arrived as they picked over the food and only took a limited range, whereas the other charities took the lot. At the time I was going out with a catholic girl of strong opinions. When I moaned about the time the nuns took to sort the food she replied in very forthright terms “Geoffrey, nuns are not greedy people…that’s why they are ****** nuns!”. Some nuns did take the lot and when I asked what happened to the food, a very Irish nun said “It all goes in the soup”. As that day the ‘waste’ was a deal of smoked salmon, the mind boggles. Hi, myself and my brother David were at St Anne’s in 1980, for around 9 months. I remember the nuns, but the refugees stand out more! They were lovely people who lived separate to the home, but within the vicinity. The smell of their cooking and their friendliness still remains with me. I remember two brothers and a sister, in the home: Joanne (who I shared a room with), Andy and little John. I also remember a staff member called Linda, who I recall got very nasty with me for laughing at her when she scolded me. Other than this, very positive memories. I was 10 back then and my brother 12. I am trying to find out about nana . My mum was adopted when she was small at three weeks old. Me and my sisters wonder if she had any family. Thank you so much. Editor’s note: sorry Virginia but we do not allow sharing of information on third parties. If you are looking to locate family members, visit GenesReunited which you can find by ‘Googling’ it. Tracey I remember you, also David. My name is John Harper so it’s bad news I am afraid about my sister Joanne as unfortunately she passed away at the young age at just 16. She died of meningitis whilst living with my mum in Telford, Shropshire where she is buried. Andy lives in Hastings. Say Hi to Dave for me if you still see him. All the best. I remember being friends with a girl called Margaret who lived in a children’s home run by nuns in the 60s. I went to St Joseph’s primary school in Black Rock. I remembered the home was in Black Rock on Balcombe Road. I also remember going there for dinner one night. Can anyone enlighten me about this home? I never thought it was in Brighton. I would like to hear from anyone who remembers me. We all thought my name was pronounced ‘Ninna Albersy’! I was at St Anne’s with John Thomson, Theresa Rogers and Anne Wall. Anne, I saw your message here, I’d love to hear from you and anyone else who was there. I was at St Anne’s from 1954-1964. From the posts here I remember very well Anne Wall ( I have a picture of us together at a garden fete in Southwick). We used to go to ballet classes together. I also remember Nina very well (always known as Beracy). Glad to know your real name. I was firstly on the “1st landing” in Monica’s room, with, I think Anne Wall, until my heart operation in 1960. After that I was moved to the 2nd landing with “Dorfy”. Just last week I visited there after over 40 years. The grounds we used to play in have totally changed, the day room is now a major Buddhist shrine. I remember very well the events we used to have there. My friends were Elizabeth Greenhill, Kathleen Warnett, Anita Dixon and Jeanine Jacobs. My greatest friend at the time was John Thompson, until he went to live with Frank Evans. I’ve got one picture of all us kids opening their presents in the Day Room on Christmas Day, 1962. I was known by my childhood nickname: Frankie. My full name is Francesca Fleming. My email is: fcfleming@gmail.com. I would enjoy hearing from anyone, Anne and Nina especially, as two I remember. I was at St Ann’s with my sister Maggie 1963/64. There was a woman helper named Connie who was very strict. I recall being there during Easter, Christmas and Summer. We attended St Agnes’ School. Would love to see some photos. I was at St Anne’s in the 1960s, leaving in 1969. I was here with my brothers Chris and Brian; we all went to St Madeline school. We were also in the film ‘Oh what a lovely war’ which I have a copy off on DVD. If you watch it I am the girl with the balloons on the pier by the gun range. I remember my time spent at weekend with Mr &Mrs Wallace who were lovely. If anyone remembers me or my brothers I would love to know. Hi, if anyone remembers me I’d love to hear from you! I was there from 67 to 76. Does anybody remember being at St Anne’s in the mid 1980’s? I was having trouble at home with my parents, so decided to take a ride in my car from Surrey towards Brighton, not knowing where I would end up, somehow I found St Anne’s and took a chance to ask the nuns if they would take me in, they very kindly accepted me and I stayed there over Christmas. They were very kind and loving providing food and lodging free. The only name I remember was of one of the staff her name being Martine who lived in Saltdean, where my nan had lived. Shame it’s now a Buddhist centre, doesn’t seem to do it justice. I lived in St Anne’s 1973 to 1975 with my brother Ronnie. I remember the O’Connor’s, and Benyovits, in fact Thomas O’Connor and Anthony were my boyfriends – I was only 10 haha. I remember the name Donna King. Sister Hilda was the nun in charge. I also remember the treats from Marks and Spencers. We went to St Mary Magdalene’s in Spring Street, then I went to Dorothy Stringer with June Porter because we went Catholic. My brother just confirmed we live in st Anne’s until 1977 so please get in touch if you remember us. I was in St Anne’s from maybe 1974 for a short time then returned in 1977 I think. I will have to check some paperwork. My sister Tracey was also sent here so please, anyone who was there in those years would love to hear from you as all my memories were very happy there. I was reading Nina’s comments about the cook at St Anne’s recently and remember Agnes in that large kitchen, in fact she is buried at St Mary’s in Portslade. We used to visit this other convent on occasions. I thought you might be interested to hear that Frances (McHugh) who helped in the kitchen a lot sadly passed away and the funeral was yesterday (8th January 2014). I tend to think of us all as we were but we are all getting older which does tend to make one look back. I notice lots of comments re films and dancing, as it happens I am still taking dancing classes and it all started with those great shows at the convent. I do remember you Nina (Alberici) but can only picture you as a young girl. Not sure how long you were at the home but I was there for 13 years. We all seem to remember that long drive which I remember walking down when I left in 1962. Leane, I am so sad to hear that your mother Nina has died, but thank you for telling us. I am pleased that in her last years she was able to share childhood memories of St Anne’s and connect with old friends on our pages here. A very memorable contributor. Before I wrote the above piece on the convent, my St Ann’s Well Gardens page was where former convent people used to share their thoughts. There are twelve there from Nina if anyone would like read them. Here’s how you get there. In the panel on the left at the top of this page select ‘Areas’ from the list. On the new page select ‘St Ann’s Well’, then ‘Introduction to St Ann’s Well’, and then ‘Welcome to St Ann’s Well’. Scroll down that page to read the messages. The first from Nina was dated 07/08/2009. We will miss her. I used to come to St Anne’s regularly on a Sunday in the early ’60s with a local youth group to meet the children and take them out for the morning, either down to the seafront or to St Ann’s Well Gardens where they played in the playground. We bought them all sweets or other things, and we were invited to come to Christmas parties or Irish dancing evenings. Does anyone remember Frank Evans who had an old London taxi with a Brylcreme bottle for indicator light? I believe John used to look after things there. I remember the Capaldis, and a boy called Jimmy who came for lunch on some Sundays as well as being taken out for a trip with my parents. Sister Benignus, and others. I think I still have photos of the Christmas parties. I was going into hospital to have an operation and to take my mind off it my husband said lets go down to Brighton for the day. I have often visited Brighton over the years, but never went back to visit St Annes, so with my hand on my heart we went to Hove. I knew I would feel very emotional as I walked down the curved path to the convent. I missed seeing the grotto to the left with the statue of Mary dressed in blue with the two conch shells at her feet. I was there in 1958 as my parents were divorced and custody of me was given to my father who put me in St Annes. I was not a Catholic so to this day don’t know how I managed to end up living there. Happy times for me, always someone to play with. Not like home life which was full of tears. I only have happy memories of my stay, angel cake, liberty bodice, hot chocolate, hot summer days on the beach and Saturday morning pictures. I aways cry when I think back to those days, but they were happy days. I haven’t been on this site for a while and was sad at hearing about the passing of Nina Alberici. I remember her very well and am delighted she had a daughter. I must look through my photos and will email you Leane. Hi Evelyn. I’ve just seen your comments and, do you know, it’s a carbon copy of my thoughts. Hope your operation was successful and that you are on the mend by now. I was at the Convent from 1949 till 1962 so our paths crossed for a few years although I don’t recognize your name – which I can’t understand. I often tell my family about those days at St Anne’s and everything you have said they have heard too. I think we were very lucky to have been in such a safe and happy home. Hope to hear further. My name then was Jean Williams. Hi Jean, yes I’m pleased to say the operation went well and I am on the mend. Do you live near Brighton and Hove? I love Brighton, always have, always will and have often wondered if many of the “in-mates” have returned to see what has happened to St Annes. I have to say I don’t remember many names of the children there, not even sure how long I was there for. I remember going to the primary school up the road and even going to dance classes. I’m so pleased that you could relate to my thoughts and memories, and I’m sure we could share quite a few more, fairisle beret for church, codliver oil and malt by the spoon, tuck shop lollies and bathtime with the Mable Lucie Attwell notice saying “Please remember don’t forget to never leave the bathroom wet”. Look forward to hearing from you again. I was in this home at the age of 3 with my two sisters Kit and Eileen. This was 90 years ago! Anyone else remember that time? Hi, I’ve just discovered this page. My Nan, Rosemary (Hewet) Howat, was in the Children’s Home until she was 18, she’s now 73. She was in there with Anthony Worall-Thompson, the famous chef. Does anyone remember her? She was a lover of Elvis Presley and always done the boys hair like Elvis. I was there from 58-66 and in love with Anna Capaldi. Where are you now? I was in the home with my brother and sister for 5 weeks – it wasn’t very pleasant. We were walked every day down to the little river and ponds near the seafront. It’s still the same today. Not happy memories. This is for Kirsty Howat regarding her message (18/04/2016). Kirsty, there were two St Anne’s children’s homes. The one your mother was at and where Antony Worrall Thompson also attended was in Vernon Terrace. Go to ‘People’ then ‘Local Folk’ then put St Anne’s Children’s Home c1960s into the search box at the top of the page. I remember in the summer of ’76. Some new play swings were installed on the grassy area between the big building and Marina and Woodside. The local paper, The Argus I think it was called, came and photographed the new installation with all the children lined up in front of it, most of the kids were the little ones from Marina and Woodside with some from the big building, I was in Brenloch on the first floor of the big building. Anyway, the photo featured in the paper, I remember seeing it, but I was not allowed to be in it because I had been naughty. In fact I think I am the reason they got the swings, they knew some kids might be bored. I’m sorry that I had some of you being naughty but I was rebellious - well I was only 13 and couldn’t deal with stuff. Somewhere in the archives of said paper may exist a copy of that photo, perhaps you remember it? You might be in it. Sister Hilda could not take to me, I’m sure she was relieved when I left in the September of 1976. But all the other staff tried there best to reach out to me. I was stubborn and had already built a big wall around myself. London taught me some bad behavior patterns and always moving around has an affect on you personally. I had previously been a guest at the Paddocks children’s home run by the Caldecott Foundation, another beautiful place. I never knew why I stayed at these places. I hope all the other children went on to good things and have happy experiences in their lives and a big thanks to the staff entrusted to care for us all. God bless. I was wondering if any of you out there may remember the Quinn children? They were here in the early 60s – there were 3 girls and two boys. Many thanks. Hi, my name is Annmarie Wallace. I am doing some research on my nan, who has passed away. I’m trying to build a family tree but I found out that she was adopted. Before she was adopted she orphaned at a children’s home run by nuns. Her name was Barbara Jean Clark, born 8th Feb 1936. Apparently she was from Kent but lived most of her life in Brighton. Is there anyone who can help me or tell me how I would find out if this was the children’s home where she lived. Many thanks. I was at St Anne’s Convent in about 1972 /73 with my older sister Wendy and brother Micheal. I was around 5 years old at the time and only remember bits and pieces of that time – such as the female helpers who gave me baths and were very caring. I recall goldfish in the bath, maybe a fish tank was being cleaned out? In the back of the building was a play area which had swings and a pink elephant climbing frame. I would love to hear from anyone who might remember us and would love to see any pictures of the home inside and out. Thank you. I too was here after going into care for the second time. I was 2 years old and there was a blood red leather sofa as you came in, white painted cupboards with toys in and the stripey toothpaste. Wore red/white gingham canvas shoes. One of the young independent flats occupied by a teenager caught fire and every now and again I will smell that same unique smell. This was circa 1976/7. Hi, I can remember being at St Annes. I have a photo somewhere of doing the nativity at Christmas. I was the angel Gabriel. It’s good to see the building hasn’t changed. I went to St Mary Magdelanes in Spring Street made my communion there then went to Cardinal Newman. I remember sister Ita. She was so loving and funny. Hi, I was at St Anne’s in the early 1980s on two occasions. I had a great time there with lots of fun memories although some of the nuns were very scary. I remember a holiday at Butlins, Bognor with some staff, kids and a Sister Kathy? Maybe wrong name. We were encouraged to enter the ballroom dancing competition together. I also remember a staff member called Maria? Marie? Spanish I think. I was in St. Anne’s in the 1950s with my sister Eileen, brothers Terry and Willy. I remember Ann Wall. My dad called me Maureen and my real name then was Margaret Caulfield, now Maggie Dougherty. I have many memories of St. Anne’s and a walk to school along the beach. Hi, Judy and Elizabeth, I wonder if my sister Eileen and I are the ones you had to your house for tea? Would love to know. I was in St Annes from 1970 -1974 along with both my sisters Lorraine & Lynda and my baby brother Alan. My sisters were on the 1st landing and I was on the 2nd landing. We were all Smith at this time. If anyone remembers any of us please contact me it would be lovely to hear from you. It would also be lovely to see any photos during these years . For anyone interested, I have located the film called The Secret filmed in 1955. St Anne’s is featured in this film which I have ordered and look forward to seeing some of the children at the home in that year.I have tried many times over the years to locate the film so very pleased to have finally found it. Hi Evelyn, do you remember Janette Macominskey or anyone for that fact? She was a girl with very long blonde hair who had a best friend called Evelyn? Reply to Maggie Dougherty from Ireland, formerly Maureen. Yes, I am sure that you and Eileen would have been the two little girls from the Convent that we used to take out and take home for tea in the 1950s. Did you have two little brothers? Maureen and Eileen took some items from teatime back to the home for their little brothers. Their father came from Ireland later to take them back there. We were very fond of them and will never forget them. I will tell my sister, Elizabeth, of your message. I am sure she will be most interested to learn that you have been in touch. Hi Jasmine. Evelyn, the girl in the last post, had long dark hair. Message for Jean Williams: I have been searching for the same film ‘The Secret’ for a number of years myself and I wonder if you could steer me in the right direction to get a copy of it to view. The film was mentioned to me by my teacher at Peckham Park School, London. I remember being an extra in ‘Oh! What a Lovely War’ aged 12. Myself and my brothers and sisters were placed in the loving care of St Annes convent childrens home until 1976. Sister Anne asked me if I’m sure I had not been here before and said that some of the children here had been in a film. I could not remember at that point, I now remember the early years of my life after a long sleep of about 40 years plus. I had indeed been at the convent and remember being in the garden talking to some girls that lived there who themselves were in the film too; my memory is now restored. But I have wondered about the film ‘The Secret’, and would like to see the convent as it was in 1955. Thank you. Hi Jasmine, I was at St Ann’s from 1957 and my best friend was Janette. She left very suddenly and I never found out what happened to her. Gary, I never had long dark hair, mine was always short curly and wild but very blonde. Jasmine do you remember me at all? I remember so much about my time there but can’t remember many of the children’s names except Janette. So lovely to read your post as I haven’t looked on this site for a long time. Hope to hear from you again. Message for Patrick Doyle. I have only just seen your comments re St Anne’s and could steer you in the right direction if still needed. Hi Evelyn, I am Janette’s stepdaughter, I’ve told Janette and she remembers you and was very emotional, she’s so happy you’re well. Please email me on jasminecoutts@hotmail.co.uk, if you would like to get in contact. I think Jan would really love to hear from you. My name is Larry Hunter. I was in St Anns Convent early 60s till late 60s. There are four of us Michael Trevor and Wayne my brothers. Anyone got photos or memories of us, please. Message for Anne Wall. I was at the home in the early 50’s along with my sister Theresa. She remembers you and Nina. I think I featured in a film scene of The Secret along with some of the other children at the home at that time; the scene with Mandy and Richard. Would love to get the film – can you help please? My no is 02891-273824. I have happy memories of my time in Brighton and so did my sister Theresa. To Jean Williams-(1-09-2017). I would be interested in obtaining a copy of the film “The Secret”. Can you please let me know who I should contact.Thanks in advance. I have wonderful memories of St Anne’s. When I worked at Wades on Western Road I met a lovely girl called Elaine Whitfield who lived there. She took me back to St Anne’s many times and the nuns were so kind. I remember Sister Claude and Sister Mary and the cook used to make the most delicious sponge cake with pink icing. I was always sent home with a large slice. I actually envied Elaine living there, There was so much love there. Eve Polcarpou – I am still in touch with Monica who is 93 and lives in Adelaide Crescent, Hove. I saw the documentary of you and your dad, and I believe I saw Peter in Les Mis or was I imaging it? Hi, this message is for anyone who remembers me, Elizabeth Greenhill I recently contacted Maria Fernandas I was at the convent from 1955/68 and I was with Monica/Ann/Dot and when I left school I stayed at the convent working for another 2 years. I went home to London but found it hard to settle as time went by it became easier,now known as Liz Truman. I was so pleased to finally get a copy and will treasure the film. We searched for so long to get any info about the film and when we found it were surprised it was so easy to obtain. So patience paid off eventually! Good luck and hope you get your copies ok.
Hi Elizabeth, of course I remember you, how lovely to see your post on the site. Often wondered what you went on to do. I left St Ann’s in 1962 but have often looked back with memories of my 13 years in the Home. Hope you remember me too. Will post again later. Hi Jean, lovely to hear from you. The reason for the note was I am writing a mini booklet about my life to leave for my children. I have never talked about my past, I have 3 boys, 6 grandchildren, married twice but having a good life. I hope you are too. What are you up to these days? Hope to hear soon. Take care. Hi my name is Albert I was in St Anne’s with my brother Desmond and sisters Jackie and Sarah between 1975 and 1978 would like to hear from anyone who remembers us. My name is Steve and I was at St Anne’s Convent during the early 60s and often wonder what happened to those I shared my time with there. I still have quite vivid memories and some names still spring to mind, these were: Joseph Downey, Mike Hunter, Rosemary Leake, (not all of the names, just a few who I remember right now) and of course Phillis who ran the top floor dorms. I used to sweep the yard at the back door almost daily due to all the leaves congregating there and remember the swings in the playground at the back of the building. I went to St Mary Madeline school for a short while before going to Cottesmore. I often wonder if it would be possible to visit the old St Anne’s building, it has a lot of memories for many who spent their early years there. Yes, I remember Monica, Dot and Anne. All like family to me. Well it has been a few years since I found this site. I have loved reading all the messages. I always wonder how life has been for all whom lived at the convent in Woodside and Marina House. This was such a big part of our life. I hope you all found happiness. Hi Josephine, how’s your family? I live in Hamilton, Ontario, Canada. Today I found a fully functioning Singer sewing machine in an antique store. Inside one of the drawers was the original manual. On the cover was the address of St. Anne’s Home. Lansdowne Rd. Hove 2 Sussex. I was excited when I found the sewing machine, I am thrilled that it has travelled such a long distance to find me! I’m sure there were several sewing machines there over the years, I had hoped to upload a photo for you but it’s not allowing photos. Any extra information you might have about it’s history can only add to the charm of my new find. I lived at St Anne’s for 6yrs in the 1960’s I was from San Francisco America My name is Charles Weigel. Hi Anthony, it’s Albert wow! it’s brilliant to see message, how are you my friend? My great memories were summer 76. wow!! Say hi to your family. Albert. I have a message for Jean Williams from Lina Dennison: If you email me I can pass you Lina’s phone number. Lina is looking forward to being in contact with you again. How interesting to read about the Singer sewing machine you have found. Having lived at St Anne’s I can say that we had a sewing room with a Singer though not sure if it was the only one. When we were older we spent time in the sewing room. Extraordinary to think that the manual has the address of the Home on it. Will we ever find out how it traveled so many miles? I have spoken to someone who lived at the home and she seems to think that there was only one Singer machine used all those years ago. Will look out for updates on this. Thanks for the information. I lived at St Anne’s for 6yrs in the 1960s I was from San Francisco My name is Charles Weigel.